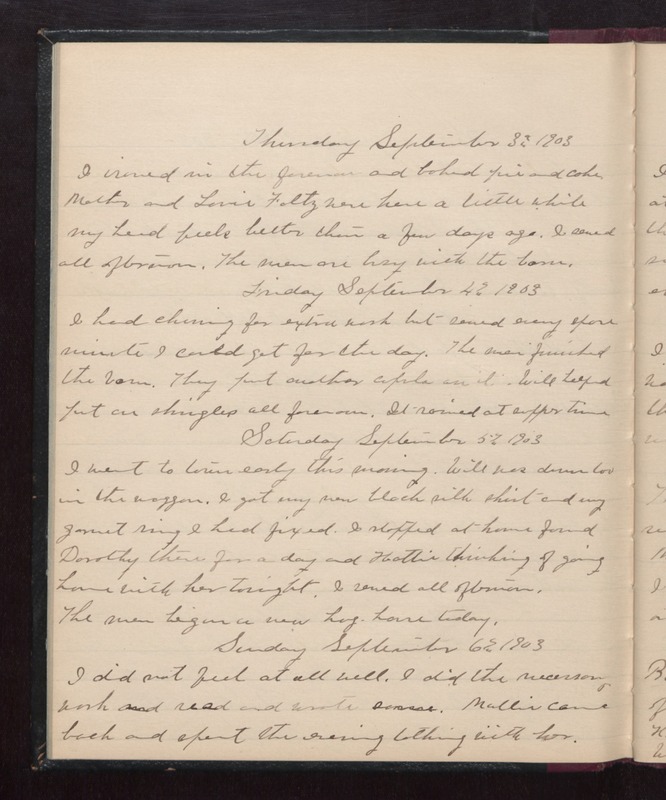 Thursday September 3rd 1903 I ironed in the forenoon and baked pie and cake Mother and Lorie Foltz were here a little while my head feels better than a few days ago. I sewed all afternoon. The men are busy with the barn. Friday September 4th 1903 I had churning for extra work but sewed every spare minutes I could got for the day. The men finished the barn. They put another cupola on it. Will helped put on shingles all forenoon. It rained at supper time. Saturday September 5th 1903 I went to town early this morning. Will was down too in the waggon. I got my new black silk shirt and my garnet ring I had fixed. I stopped at home found Dorothy there for a day and Hattie thinking of going home with her tonight. I sewed all afternoon. The men began a new hog house today. Sunday September 6th 1903 I did not feel at all well. I did the necessary work and read and wrote some. Mollie came back and spent the evening talking with her.